The Bahamas welcomed the second Ambassador from the Republic of Ireland following the Presentation of Letters of Credence during a ceremony at Government House on Thursday, February 3, 2011. Pictured from left are Deputy Prime Minister and Minister of Foreign Affairs the Hon. 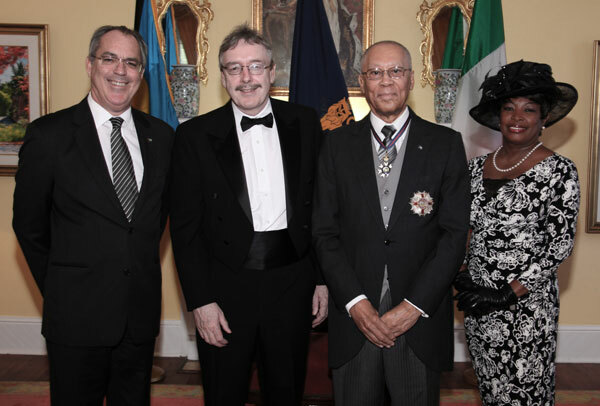 Brent Symonette; Dr. John Raymond Bassett, Ambassador of the Republic of Ireland to The Bahamas; Governor General Sir Arthur Foulkes, and Joan Lady Foulkes. Nassau, The Bahamas – The Bahamas is seeking the support of the Republic of Ireland in its quest for full membership in the World Trade Organisation (WTO). Republic of Ireland to the Commonwealth of The Bahamas, during a ceremony at Government House on Thursday, February 3, 2011. Sir Arthur also accepted Letters of Recall of Ambassador Bassett’s predecessor His Excellency Declan Kelly. The Bahamas and Ireland are both island nations on either side of the Atlantic Ocean, and are both steeped in a rich history and culture. “Yet this same Atlantic Ocean links us historically and culturally via the arrival of the Puritan Eleutheran Adventures from other British Colonies in the mid 1600s, which included Irish families. This continues to be documented in the names we share of families and landmarks,” Sir Arthur said. He also noted that both countries are grounded in the fundamental values of democracy, the rule of law, the promotion and protection of human rights, and respect for social justice. Governor General Sir Arthur Foulkes, left, accepts Letters of Credence from Dr John Raymond Bassett, Ambassador of the Republic of Ireland to the Commonwealth of The Bahamas, during a ceremony at Government House on Thursday, February 3, 2011. “We also share a mutual commitment to the benefits of multilateralism and regional integration, which serve to strengthen our sovereignty in the pursuit of prosperity of our peoples in the face of the economic, financial, climatic and environmental, energy and food challenges in a world that is more competitive due to increased globalisation. “In this context, we laud the entrepreneurial prowess of the Irish people demonstrated domestically and in the Diaspora,” he said. 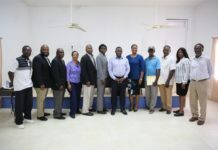 Relations between The Bahamas and Ireland have taken both countries on a renewed trade route via the European Commission-CARIFORUM Economic Partnership Agreement. “The Bahamas is aware of, commiserates and identifies with the recent experiences of Ireland from the impact of the global economic downturn and the banking sector crisis,” Sir Arthur said. 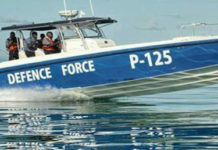 He added that The Bahamas has responded by being in the forefront of reform for transparent and robust regulation, and is willing to share the benefit of its experience with other global partners. “The Bahamas would therefore welcome the support of the Irish Republic in this endeavour, as well as for the full accession of The Bahamas as a member of the World Trade Organisation,” Sir Arthur said. Acknowledging Ambassador Bassett as a career diplomat, Sir Arthur said The Bahamas would welcome his proposal to nominate an Honorary Consul as a first step to increasing the existing good relations between both countries, and to explore the potential for diversification. Ambassador Bassett, 59, entered the Department of Foreign Affairs as a Third Secretary on February 13, 1978. He also served at the Embassy of Ireland in Canberra, and as Joint Secretary British-Irish Inter-government Secretariat in Belfast. 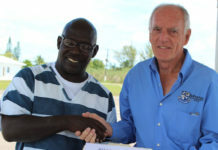 He pledged to work hard during his term to build relations between The Bahamas and Ireland. “Though our two countries are situated on opposite sides of the Atlantic Ocean, we share many things in common, we are both islands, but without a doubt The Bahamas wins the prize when it comes to climate. Your beautiful island nation always conjures up the warmest vistas for Irish People, especially during our cold and damp winters,” Ambassador Bassett said. The Irish began to arrive in the Caribbean during the early 17th Century. 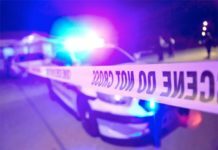 There is evidence in St Kitts, Barbados, Nevis, Antigua and Montserrat. Some of the earliest references to Irish in The Bahamas relate to Eleuthera in 1648. “There is a small Irish community in The Bahamas and I look forward greatly to meeting up with them. 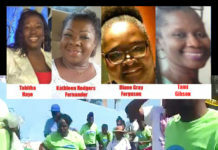 From all reports they are very happy here in The Bahamas,” Ambassador Bassett said. As both countries are influenced by their proximity to the sea, he said this means that both economies are very opened to the world. He cited the recent economic turbulences have impacted both countries; as financial services and tourism are important elements of both economies. “We are confident that the worst of our economic problems are over. Then most recent economic indicators are all pointing in more positive directions, with economic growth resuming and the public finances and the labour market having stabilised,” Ambassador Bassett said. He added that the recent negotiations with the International Monetary Fund, European Union and the European Central bank has been concluded satisfactorily and that Ireland is back on the road to recovery with strong export growth. Ambassador Bassett is posted at the Embassy of Ireland in Canada, which represents interests in The Bahamas and Jamaica. The first Irish Ambassador was welcomed on Thursday, January 24, 2008. Ambassador Bassett’s visit entailed paying Courtesy Calls on , Prime Minister the Rt Hon Hubert Ingraham; Deputy Prime Minister and Minister of Foreign Affairs the Hon Brent Symonette, and other officials. 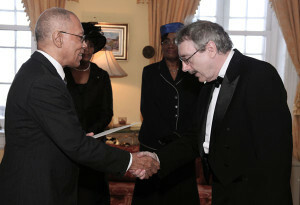 Dr John Raymond Bassett, Ambassador of the Republic of Ireland to the Commonwealth of The Bahamas, right, presents his Credentials to Governor General Sir Arthur Foulkes, left, during a ceremony at Government House on Thursday, February 3, 2011. At far left is Deputy Prime Minister and Minister of Foreign Affairs the Hon. Brent Symonette.